Bwindi National Park contains approximately half of the world’s population of mountain gorillas, currently estimated to be about 880. Given that Rwanda has recently doubled their fees to $1500, and Democratic Republic of Congo (DRC) is not very secure, it is probably the best place to see them. It is not cheap. Currently the price of a permit for a Non East African is USD 600. Despite the cost, almost everyone who has stayed at Cuckooland and gone tracking has said it was worth it, many describing it as an experience of a lifetime. 1. Direct from Uganda Wildlife Authority (UWA). Send an email to joyce.nambuba@ugandawildlife.org stating when you want to track, how many people, and from which tracking station. 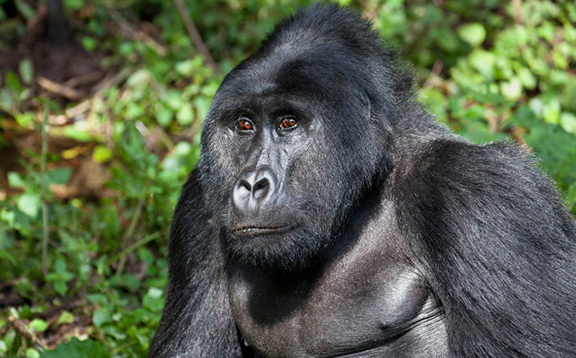 If you want to stay at Cuckooland, make sure to request to track from RUHIJA tracking station, where there are 4 groups of habituated gorillas, and which is the nearest station to Cuckooland. U.W.A should get back to you with payment details and say the whole process may take around 10 days. If you don’t get an answer to your email or the process is taking too long, contact me, Philip, at info@bwindicuckooland.com and I will call Joyce and check with her. 2. Go through an intermediary. We recommend Buffalo Safari Camps at www.buffalosafaricamps.com They can also organize private or group safaris for you at reasonable costs and also can rent out vehicles for those who want to do ‘self-drive’. They can arrange the permits for you through the UWA office in Kampala. No one staying at Cuckooland has failed to see the gorillas when going tracking, so your chances of seeing them are very high. But you need to be aware that we are in mountainous country with steep-sided valleys, and once inside the forest, you may spend quite a lot of time, walking off the path to locate the gorillas. Generally, you need to be reasonably fit, at least used to some walking, preferably hill-walking to do the tracking. Having said that, we have had many guests, who were not so fit, who still managed to see the gorillas. To reach the gorillas, you may have to walk between 20 minutes and 3 hours, depending on where the gorillas have spent the previous night, and obviously a similar time to get back. On average, people spend around 1 ½ hours walking to reach them and the same to come back. You are allowed 1 hour with the gorillas, and most people get very close to them, within a few metres. You may even have one brush past you! Most people return to the lodge by 2 or 3pm after setting off from Ruhija at around 8:30am. Porters are available at USD15 to carry your day-bags, packed lunches (which we provide), water etc. 1. Good walking boots or shoes, although some people have done it in trainers. 2. Insect repellent. There are midges and mosquitos in the forest and it’s best to spray exposed areas of skin. 3. Lightweight waterproofs if tracking in the rainy season. At other times, they are not essential. 4. 1-2 litres of water per person. You may get dehydrated if you have to do a lot of climbing. Snacks/ packed lunches are also advisable, as you may use a lot of energy. 5. Don’t forget your gorilla permits. These have to be picked up at UWA Kampala office, unless you have arranged an intermediary to get them for you. 6. Serious I.D. e.g. passport or driving license. Finally, we hope you decide to take this adventure and look forward to welcoming you at Cuckooland in the near future.